2017 FIFA U-17 World Cup was the 17th U-17 FIFA World Cup which is a biennial football tournament. It was held in India from 6th to 28 October 2017. It was the First time that India hosted a FIFA tournament and since 2013 the first Asian country to host U-17 World Cup. Javier Cappi was the Local Organising Committee Director. The Matches were played in six stadiums in six host cities with the final taking place in Salt Lake Stadium, Kolkata. Twenty-three teams, besides hosts India qualified and played in the tournament. The attendance for this World Cup was a record 1,347,133 surpassing China's record in 1985 with 1,230,976. The average attendance per match was 25,906. The six host cities and the stadiums were Salt Lake Stadium, Kolkata, Jawaharlal Nehru Stadiums at Kochi & New Delhi, D Y Patil Stadium, Navi Mumbai, Indira Gandhi Stadium, Guwahati and Fatorda Stadium Margao. England won the U-17 World Cup for the first time beating Spain 5-2 in the Final. England became only the second nation after Brazil in 2003, to win both of FIFA's under-age (U-17 & U-20) tournaments in the same calendar year. Brazil beat Mali 2-0 in the third-place playoffs to clinch the third place. A total of 52 matches were played and 183 goals were scored ( 3.52 per match). Phil Foden of England won the Golden Ball award, Rhian Brewster of England scored eight goals and won the Golden Boot, Gabriel Brazao of Brazil won the Golden Glove and Brazil was awarded the FIFA Fair Play award. Philatelic coverage of the event - India Post did not release any Postage stamps to commemorate this event, however, two unique limited edition special covers were released at Kolkata and Kochi. 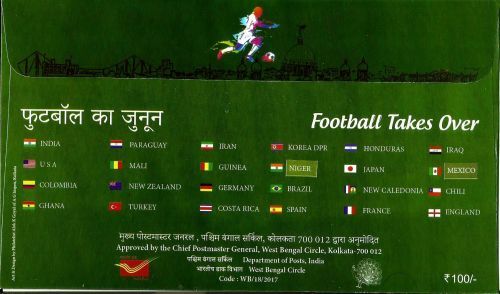 This special limited edition unique cover was released in Kolkata on 02 October 2017 and it features the tag line "Football Takes Over" along with names and flags of participating countries. 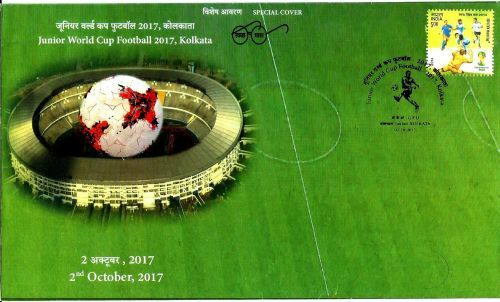 This special, unique and limited edition cover featuring the Jawaharlal Nehru Stadium at Kaloor, Kochi was released on 07 October 2017-when the first match was played at Kochi.